Your business is just like raising a child. What made me think of this post was an online friend of mine Camille Cameron commenting on a blog post I had done. Her words of wisdom were just too great to let it pass. Not only were they great they were so true an also an analogy I had never really thought about before. At some point, you decide you want a child. There is then the conception and/or acquiring your business. Your business is just like an infant it's new, it's tiny and some time will pass before the child/business can stand on its own. You will love and nurture your business just as you would a child because it is your child. 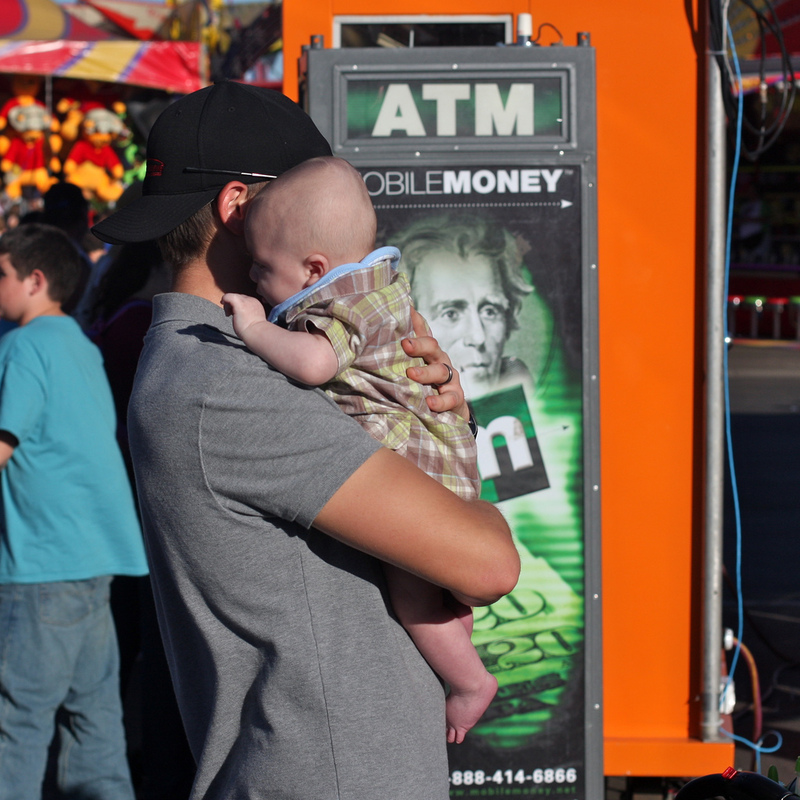 What I noticed in this picture that seemed so appropriate is the ATM machine behind the man with the baby. Many times when a person gets so excited about having a baby as well as a business they don't stop and think about the cost. If you plan on either one you need to be able to provide for both. If you think you can do either one without putting out money, you should scrub the whole idea of doing either. I don't think there is anyone in their right mind that would tell you "Join parenthood it's easy and it requires no money or credit card and you can accomplish it in a week, month or year." People, please! However, you will find more than enough scammers and unethical sponsors out there that will tell you those very words about starting a business, to which again I say, "PEOPLE PLEASE!" You might think I don't want anyone in my business talking like this, not true I would love to have every single one of you that want to own your own business and work online with me, but I"m not going to lie or be unethical to convince anyone! My mom, "God rest her soul raised me better." What I want for you or anyone that makes the decision to own their own business on or offline is for you to not get taken by the scammers and unethical people. Hi Sandy :) thank you so much. Great article, Susan ... so transparent and honest .... and REFRESHING! Thanks for sharing it. Thank you so much I feel like if I have made someone think deeper and reach down deep to see a fresh view I have done my job. I think many times I get to feeling like people just take words at face value without processing their own views and coming to their own conclusions. We have Google right at our fingertips primed and ready to tell us other peoples views, and don't tend to think things through for ourselves. First, I want to thank you for making me think deeper. In a way you did write this blog or at the very least had a major hand in it for that I also thank you. Marketing is never about us it's about others. When you make it about you then you have failed. When you make it about money and not value again you have failed. You are right it is all about branding yourself but not just branding yourself but doing it in a positive light. It seems to me you are doing just fine and have learned so much, that in its self is great but you know what is even greater? The fact that you will pass on your knowledge, you will inspire, you will teach, and you will positively impact others lives. There will be times you will never even know what you have done for someone else and that is why I wanted to let you know, you did inspire, teach and positively impact me and my life. Not only me actually but all those my post will inspire you can be assured you have had a hand in it as well. Thank you, my wonderful friend, and yes indeed together we will make this world better and hopefully the reputation of marketing as well. Have a wonderfully blessed day. Good morning Susan I awoke this morning do ing my morning rituals to get the day started. Went into my phone and saw the notification from Terry. I am saying to myself I didn't write this blog , although the headline is familiar. I read your blog post and I am filled with chills through my entire body of joy and filled with tears. I got the lesson. I am understanding day by day with all the online business classes and YouTube videos. It's all about offering value to people's lives. When I first started promoting products on line for me it was all about pushing my product first. What I now for sure is it's all about branding myself and offering something of value to the world. Dennis was one of the first person on the IBO platform that mentioned it to me ,at that time I had no understanding of what he meant. I thank Terry for creating this platform for being the glue that keeps us together. What a wonderful being. Susan all I can say is much love , care and success on your life journey. We will make this world better. Have a golden day. Interesting analogy and requires deep thought on this. Thank you for sharing your wisdom. After reading your blog post Susan, there is nothing else to say except "Amen" to every word because you nailed it. Thanks to Camille for inspiring you to write it. You're a good friend that I'm happy to know. Wishing you the very best in all you do. I will be post this on the SE blog to give it even more exposure for many more to see.